Blue Oven Farm, like the bakery, is committed to the highest quality, fresh, local products. We are organic and sustainable meanwhile making strides in building a farm-to-table bridge between the bakery and the farm, and ultimately to you at your local farmers' market location throughout the season. 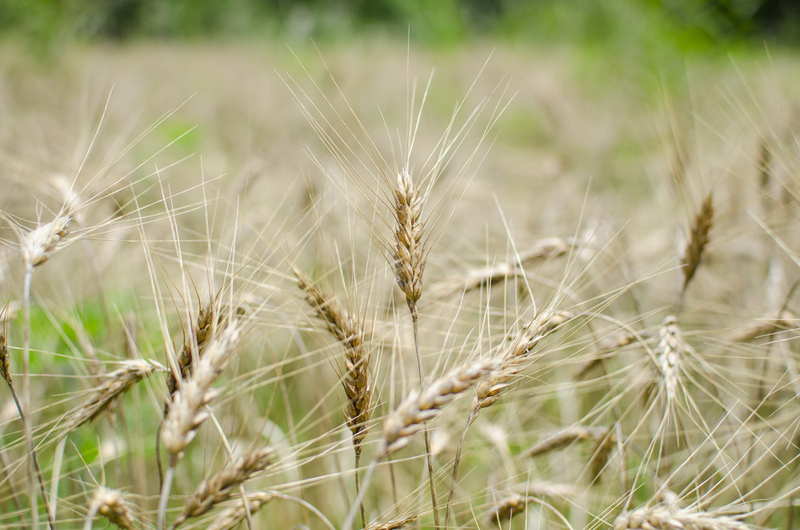 Blue Oven is committed to creating a system where local wheat is grown, stone-milled in our mill house and used to make the bread that we bake fresh in our wood-fired ovens. Not only does this help to create a better tasting bread, but it also creates a much healthier product for our customers. Our whole-wheat flour is a keystone in our bakery but the fruits and vegetables from our farm and the eggs from our hens are vital pieces that serve to bring an even better Blue Oven to every market. Along with our efforts to supplement our bakery with produce and milled flour we also work with Cincinnati-area restaurants to help them create new and exciting dishes of their own. As the new property develops we hope to serve an even greater restaurant need with all that Blue Oven Farm has to offer. Restaurants looking to order produce from Blue Oven should contact christinablueovenbakery@gmail.com. Our hard red winter wheat is finally ready for harvest! Check out our progress at Blue Oven Farm! Our hard red winter wheat has finally been harvested after a long winter of waiting! We're happy to share our progress with you at Blue Oven Farm! Berries from our hard red winter wheat are separated in preparation for milling! Over the past several years, we've come to discover that our wheat can be used in exciting ways we never expected. As our wheat crop has grown so has the excitement from local breweries and distilleries looking to turn our most important crop into new blends of beer and bourbon. We've partnered with several breweries who take our sprouted wheat berries, toast them for flavor (malting) and using them to produce exciting new brews. We've had a long partnership with Rhinegeist in our regular delivery of soft pretzels to their tap room for you to enjoy with your Truth or Cougar. For several years they've used our wheat to make a seasonal limited-release Saison Blue. Beer and bread is a perfect pair, and we are always on the lookout for new brewery partners. We stumbled on Mother Stewart's through our newest farmers' market in Springfield, Ohio. Mother Stewart's opens its doors during the winter for the Springfield Farmers' Market, and in our first week there we decided to team up with them as we'd done with our other brewery friends. We brought them our malted wheat, and they took care of the rest. A NOTE ON BEER MAKING: Brewing beer like baking bread starts with the grains you're going to use in your mash or in your dough. At Blue Oven we use wheat grown on our farm and mix it with a combination of dark rye flour, bread flour or all-purpose flour in order to achieve the right mix for flavor and lift. In a similar way, a brewery uses a mix of malt and grains, rye, wheat, barley, and oats to achieve the right mix for each variety they produce. This is where wheat grown at Blue Oven comes in. A malted wheat can be used in a variety of ways in beer making and our brewing partners like Mother Stewart's use our wheat and bread to create exciting flavors in different ways, and that's the exciting part about the brewing process for us. In a brewery they don't create flour when they mill their grain, but instead use a rough crack in order to release sugars in the grain that will help in the fermenting process. Once the milling is complete the cracked grains are added to a tank or a "Mash Tun" and mixed with super-heated water and more grains like oats and turned into mash. This mixture brews and a sugary wort is created then transferred into a large kettle. The kettle is where hops are added. Some folks like to use flowered hops and others use pellets, but the results depend on the timing in which they're added. Adding hops before, during, and post boil at different intervals impact different notes in the beer that help to distinguish that beer from another beer of the same variety from a brewery. After this process all the remaining sediment is removed and the liquid is transferred to another tank to cool a necessary step to take before the next part of the process. The fermentation begins when yeast is added. In many cases that yeast is a proprietary ingredient of the brewery like the mother sourdough at Blue Oven, and is grown and kept for years. You can also use a more processed yeast as well depending on the scale you're brewing. Once the yeast is added and gets to work, the wort is now officially turning into beer and will now start to mature and develop. In the final step, the beer is transferred or filtered into another tank where it is carbonated and held in a process called "cellaring" where you build the type of effervescence you desire. One other venture that is years down the road, is our partnership with New Riff distillery in Newport, KY. Through one of our regular customers at the Hyde Park Farmers' Market we found another new way to produce something incredible with our wheat. New Riff took on a couple tons of our wheat berries and they used that grain to turn into mash and distill into a wheated bourbon that continues to age. We're looking forward to trying the first batch of Blue Oven bourbon, and we hope to continue a successful relationship into the future. Check out some photos below of the process at New Riff!